The stamped image challenge at the Art for the Creative Minds Yahoo group brought us a stamped image of a lady’s head in the mail. 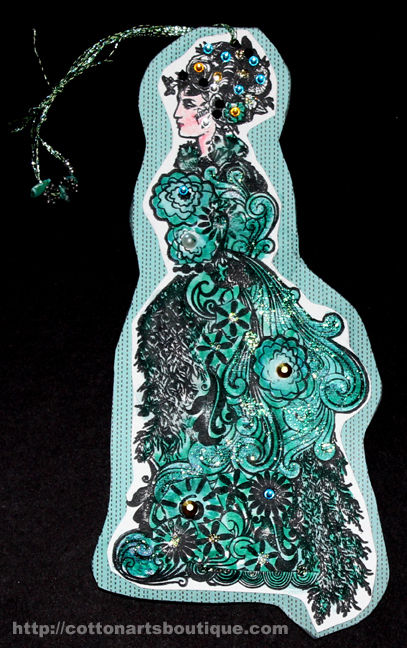 I used a handful of stamps to stamp onto card and then cut them out and collaged them into a dress for the head. I then scanned her in so I could print her out at a reduced size. I used Tom Bow markers to colour her after laying down some clear glitter glue. The markers coloured the glitter as well so I had matching glitter on her dress. I also created a smaller size to put on a 5×5 inch card. This one I chose to leave plain except for a few little stick ons. 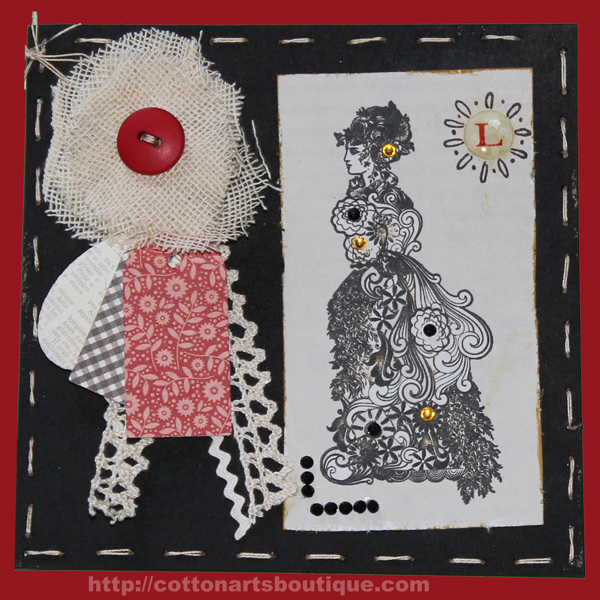 I love creating ATCs … these were made for the Art For the Creative Mind Yahoo Group. Pearled water paints on home made paper made the background. The angel fish and the sea horse were made with a stencil and a mix of modeling paste and acrylics. Seaweed was pulled from a piece of shiny cord and the bottom was made with a piece of burlap. Trees have always been a favourite of mine. They do so much for us and share everything they have whether it is their life’s blood …. sap …. or their fruit …. nuts, apples … and they breathe for us, cleaning our planet each and every day. What do we do to them? We cut them down in outstanding numbers. Do they feel the teeth of the saw cutting through them? We don’t really know because we can’t read their “language” and they can’t tell us. I feel they must. How can they not? 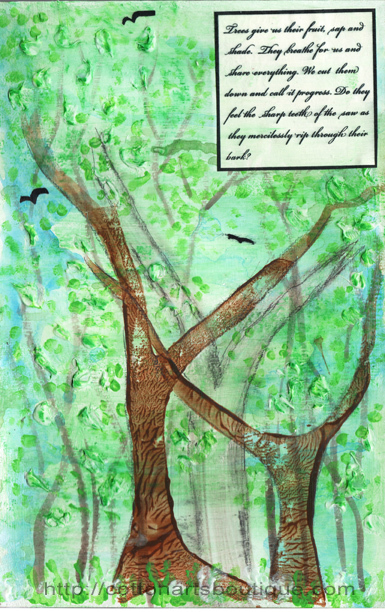 On this page I have drawn a ghost tree to represent all the trees that we have obliterated on our quest for progress. The two trees in the foreground were stamped using stamps I cut from foam, the leaves were done with modeling paste that I covered with pastel chalk after the paste had dried. I used gel medium to cover them which smeared the chalk and created the depth of a forest just budding out in the spring. 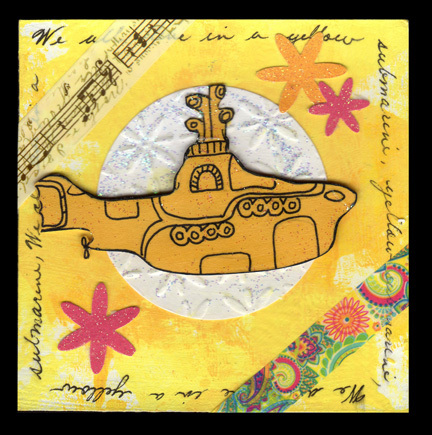 We all live in a Yellow Submarine, Yellow Submarine …. Yellow and bright were the guidelines for April’s 4×4 fat book page at the Art For the Creative Mind yahoo group. I went right to the Beatles yellow submarine. I love both the movie and the song and when I found the psychedelic paisley washi tape in my stash I knew that is what it had to be. Added some glitz and glitter to finish it off. Trust is the glue of life ….. 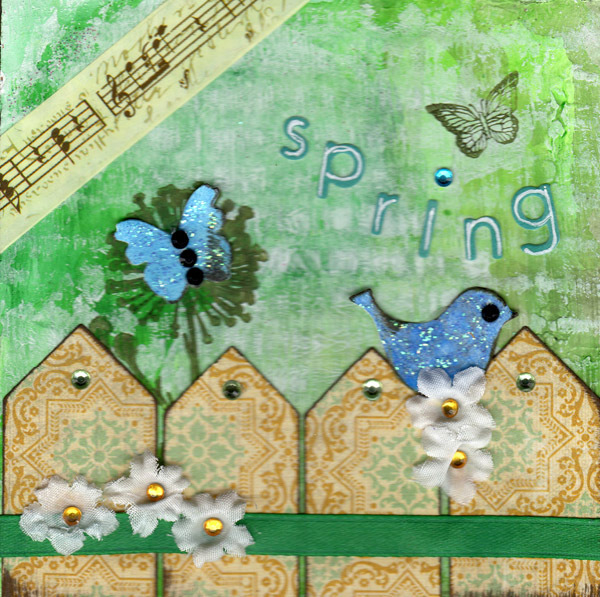 The March journal page for the Art of the Creative Mind yahoo group was ‘trust’ with a nature theme. 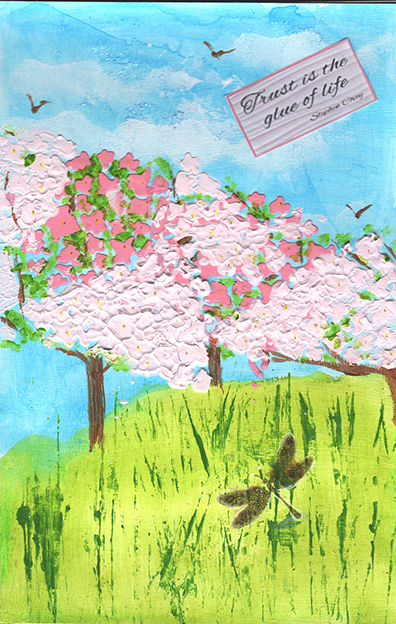 I created a field of spring tree blossoms. The background was painted with watercolour crayons on gesso. The tree blossoms are modeling paste and stencils. I then painted the birds, leaves, grass and tree trunks with acrylics and the clouds are a bit of sponged gesso. I added a bit of sparkle just as there would be on a bright spring day.